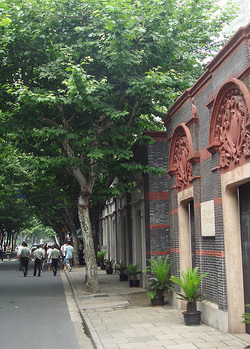 The Chinese Communist party was founded in a girls' school in Shanghai in 1921. The two founding figures were Li Dazhao and Chen Duxiu, neither of whom were at this first congress. It is important to stress that the Comintern played a big role in the setting up of the Chinese Communist party (although this is also a point of some debate). The girls' school in Shanghai where the first congress of the Chinese Communist party was held. Cofounded CCP with Chen Duxiu in 1921. Fiffered from the Orthodox Communist view that revolution had to come from the urban proletariat and instead saw the peasantry in China as having a key role to play in the revolution. Joined the GMD in 1922 as part of the first united front. Was executed (and his daughter tortured) under the orders of Manchurian warlord Zhang Zoulin in 1927. Took a more traditional communist view than Mao and thought revolution should come from the urban proletariat. This difference led to arguments with Mao and Chen's eventual expulsion from the CCP. Spent time in a Nationalist jail before being released on parole. Joined the Communists in 1922. He took part in expeditions against the warlords. Seen as having exceptional people skills but was very much subordinate to Mao throughout his career, which included taking public blame for Mao's mistakes at certain points. In 1918, moved to Beijing and worked as a librarian at the university. Exposed to Marxism, and other revolutionary ideas, while at the university. Returned to Hunan and soon emerged as a peasant organiser. Used this power base to get control over the party. Believed in guerrilla warfare tactics which did bring him into conflict with Soviet advisors, especially during the encirclement campaigns. The Long March cemented his position in the party, leaving him the leader of the communists. The history of modern China has traditionally lent itself to the study of key individuals. This view of history emphasises the importance of the actions of individuals in shaping historical events. Mao's role in particular has aroused intense interest from historians. It is important to stress that both positive and negative accounts of individuals are equally examples of the 'Great Man' school of history. One recent example of this would be Chang and Halliday's 'Mao: An Untold Story' which portrays Mao in an extremely critical light. While it has been attacked by academic historians for inaccuracies, 'Mao: An Untold Story', has had a huge impact. Subaltern history emphasises the role of groups outwith the ruling elite when it comes to shaping historical outcomes. Under this view, 'subaltern' groups which can come from any part of society are agents of their own destiny able to make and unmake rulers. This is particularly relevant to any study of why the CCP were able to win the Chinese Civil War against the Nationalists, despite the Nationalists enjoying extensive support from America.